So I reverted to the other thing I know most about: CSR reports. CSR Reports are a heterogeneous breed and it's almost impossible to compare or rank them, despite the several CSR Report competitions and awards that occur each year. I don't recall seeing one single dominant methodology which evaluates CSR Reports in a comprehensive way. Each competition or award has its own criteria or judging panel. Often the content of the report gets evaluated alongside the presentation of the content, which confuses things a little. You may have a good story but tell it badly, or vise versa. Either way, this makes it even harder to tickbox a score for reports. Often, it may just be a subjective evaluation based on things which are not necessarily comparable. As you probably know if you are a follower of the CSR Reporting blog, I tend to read quite a lot of reports and also write reviews for CorporateRegister.com and Ethical Corporation. You can see a full list of the reports I have reviewed (it's almost up to date!) here on my website. For those reports which I review in detail, rather than just read through for interest, I have been keeping a sort of scorecard, so that I can recall how I evaluated a report and what elements the report included or didn't . My "methodology" is mostly based on the pesence (or absence) of specific reporting elements, for which I award points, with a small portion of the overall points kept for a more "qualitative" assessment based on how I assess the report design and whether it has succeeded in getting over a credible message. I have evaluated 25 reports in this way in 2009. I won't share the methodology at this time, as I prefer to run with it for another year and then see how to refine it before I open it up to praise or, most probably, criticism. However, some reports did come out on top of the pack. The overall winner in my 25 detailed reviews for 2010 was Dow Chemicals 2009 GRI Report (see my review here) . Despite calling this a "chemistry-set" report because it follows the GRI index to the letter both in substance and in form, just like a chemistry experiment, something Dow excels in, the report does contain the key elements of a "good" report and enables fast navigation to whatever it is that you are looking for. It's a little dry, without internal or external "voices" that bring reports to life, but it's comprehensive, clear and transparent. Others that I rated highly were Hyundai Engineering and Construction, Centrica and the BBC. But probably the best reports are the ones that stick in my mind as being memorable and / or caused me to write about them in my blog or elsewhere (or want to, even if I didn't manage to make the time to do so). Danisco 2009/2010 Sustainability Report : This is an award-winning report which I blogged about here and which covers indirect impacts and sustainability context commendably, delivering a credible report, including open discussion of challenges and difficulties. AHA! 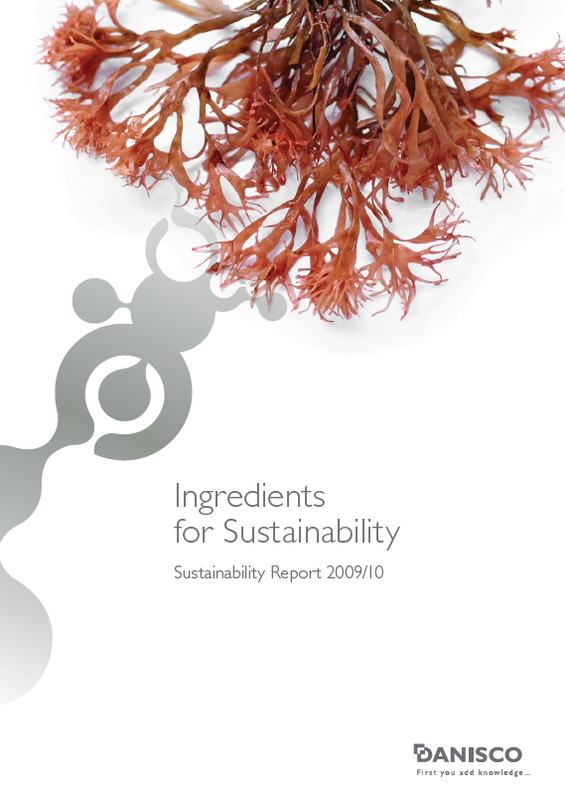 2009 Sustainability Report : This report always sticks in my mind as an entirely creative, totally credible, short, readable, persuasive account of how this small agency takes on board sustainability principles. This is what I wrote about it in on the ole blog. If you thought a one pager report was a non-starter, AHA proves you wrong. Impahla Clothing of South Africa Sustainability Report 2009 : Each Impahla report is better than the previous one and though the first two were outstanding, this one is even outstandinger. A small, privately-owned garment manufacturer in South Africa teaches us all how to produce an honest, balanced, throroughly credible report. In this third production, all 176 employees are photographed. What an inspired approach! Well worth a look if you are a small business and want to know a) how to write a report b) how sustainability reporting benefits your business and c) anything worth knowing about Impahla clothing. Coca Cola Enterprises Corporate Responsibility and Sustainability Report 2009 : I liked this report because mainly because of its overall balance and coverage of all core issues, and also the way the Company celebrates its employees and gives them much airtime in their reporting and throughout their sustainability processes. Colourful, interesting and well-written, this is a nice reflection of a large company doing good things. Campbell Soup Sustainability Report 2010 : A superb report with a clear concept which runs well through all the sections and makes it clear that this company has a social mission and is aligned to deliver it. Bold colours, bold actions and bold goals. The report is also well supported by outstanding social media engagement led by the CSR meister @dstangis who maintains one of the top spots as an inspiring leader in our community of sustainability professionals. SAP Sustainability Report 2009 : Whilst I do have reservations about totally online reporting, I cannot exclude SAP from this top ten line-up. Their report was a bold new entry into the social-media-engagement-style report, with online everything and interactivity par excellence. It will be interesting to see if SAP feels this approach has benefited them in 2009/2010 and I am looking forward to see how they navigate the reporting format options next year. Burt's Bees 2010 Multimedia Report I mentioned this report recently in my blog here. I call it the Burt's Bees Movie as it's a Sustainability Report written in videos. It's a slick production which reflects a true passion for a sustainable culture and lots of budding Hollywood actors. Nicely innovative, pleasant to read / watch / listen to but make sure you have 75 minutes to spare. And popcorn. IMC2 Positive Impact Report 2009 : I have been tracking IMC2's reporting since their first report three years ago. This is another small, privately owned business which is doing great things and maturing in their sustainability reporting. I called this report "Charm with outcomes" in my review for CorporateRegister.com. This report makes a clear statement about marketing and the changes we need to see in the marketing world, and whilst there is still room for more comprehensive reporting, it's a fine example of a small-business big-impact report. Wal-mart Sustainability Report 2009 : I can't begin to think where you would start in compiling a global sustainability report for a corporation which is larger than many countries and has impacts so broad and diverse that they only need to change pencils (do people stiill use pencils?) and the ripple is felt all over the world. Wal-mart do a commendable job in their 2009, 111 page, report. If you want to be picky, you can find a hundred things that you could recommend Wal-Mart do better in their ongoing reporting efforts, but the leadership demonstrated in their approach, the relatively new-found enlightenment regarding sustainability and the significant progress made in the reporting year makes this report a Top Ten for 2010. There are many other reports I would have liked to mention but I promised myself I would list ten only. Now that I look back, I am conscious that this list is not very diverse and doesn't include some of the fabulous reports coming out of the Far East and emerging economy countries. Perhaps I will have to do another Top Ten in the near future, because clearly, ten doesn't cut it. In the meantime though, this is it. I would be delighted to hear about your fave reports from 2010 if you have the energy to scribble a response to this post. Thanks to all the reporters around the world who keep me educated, entertained, inspired, sometimes frustrated but always appreciative of their efforts to transform business through greater accountability and transparency. Happy end of 2010 and even happier 2011 to all the CSR Reporting blog readers! Ho! Ho! Ho! Its the time to rejoice and be merry. Santa has a long tradition of reporting and is about to publish his 1746th CSR Report. (See his 1745th report here). Santa sent me his report for a pre-publication review (a service I offer to all corporate reporters - haha - PLUG!). I couldnt resist sharing with you Santa's introduction to his 2010 report (with permission, of course!) . It is that time of the year again when the bells jingle, the carols carol, the elves work overtime and the reindeer suffer from torn ligaments. Also, at this time, I aim to publish my assessment of my sustainability impacts during the past year and communicate them transparently to all my billions of stakeholders all over the globe. I have been doing this now for the past 1745 years, and each time I sit down to write a sustainability report, I get that familiar warmth that comes from the knowledge that I am simply a wonderful corporate citizen (and even if I weren't, I wouldnt say). This year has been a particularly difficult year for Santa.. The effects of the Global Financial Crisis have reduced the disposable income of many who bought lavish gifts for distribution at Xmas, the failure of major global economies such as Iceland have led to decommercialisation of Santa merchandise and the BP Oil Spill Aftermath promises to make for a slippery arrival in the Gulf of Mexico. Instead of snow-hooves, I have had to purchase oil-proof wellingtons for the entire reindeer fleet. You will be pleased to note, however, that these are indeed made from 100% recycled post consumer organic waste. I just hope the reindeer don't eat them. Despite the difficulties, I have remained committed to Santa Values of giving, giving and giving and to my favourite colours - red and green. Red is of course the traditional symbol of the Santa cult, and cheap impersonations of Santa in purple, orange or hot pink have not gained much ground, I am pleased to note. Green of course is the colour of the environment, without which we wouldn't have, well, an environment. I have also remained committed to my stakeholders: my workforce of 501,380 elves (down by 14% in 2010 after a difficult downsizing program - we tried to downsize by putting all the elves on a lettuce diet, but four died, so we reverted to standard redundancy letters), my fleet of 103,000 reindeer (and no, despite the persistent approaches by Better Place, I will not consider moving to an electric reindeer fleet until Shai Agassi can guarantee battery exchange stations in every chimney and department store), the billions of children who receive my gifts (and some are very BIG children), and environmental activists (who recommend downloadable Xmas gifts powered by Google's sustainable servers). I was particularly pleased to note the recognition given by Gap Inc to my reindeers, even though they didn't include me in their reindeer movie. Increase gender balance in the elf workforce (by demanding that female elves put on weight so that their average weight is in balance with the average weight of the male elves). Feedback from external stakeholders on lat year's report through my Santa.net website was double that of previous years. Two people gave input. The first congratulated Santa Inc. on an outstanding report. The second was from one of the Big Four, asking if we intend to assure the 2010 report. My position on assurance remains as in previous years. If you don't believe ME, then why should you believe anyone else? Finally, it remains only for me to wish all the Citizens of the Universe a wonderful joyous and happy Christmas. Remember to spread a little goodwill this Christmas - donate (a lot) to Santa.net. Happy Christmas and Happy Holidays to all! Aside from the wasteful packaging, just think of all that extra air that is being transported all over the world in this box, and all the extra weight that requires all that extra energy to move around. And the extra cost to me, the consumer, for all of this cost the company is incurring. In a company with an embedded sustainability culture, this wouldn't happen. Adobe claim to be environmentally conscious and environmentally responsible.Their 2009 CSR summary report proudly notes that Adobe was recognized by Newsweek as one of the 20 greenest companies in the world (This was in 2009. Actually, they ranked #7 in 2010) . Adobe writes "we highly encourage and promote conscientious environmental stewardship among our employees and our business partners." The summary report doesn't refer specifically to packaging, and I couldn't find anything on packaging initiatives on the Adobe CSR website. All in all, a major FAIL for ADOBE in packaging sustainability. Be jovial and friendly to all that read me. The fact that my content is serious and complex, shouldn't mean that reading me becomes a boring and frustrating task. I am going to project a positive and enjoyable reading experience, and use language which people can understand. I will add a quiz or two, a crossword, and sudoku for the really intelligent ones. I will smile at all I meet, and jovially invite them to come and read me. (Of course, I reserve the right to kick 'em in the ahem if they don't) (Even resolutions have limits). Get along well with my online stepsister. I know that online reports are stealing the limelight these days, and I can understand that, but I am going to make a real effort to get along well with my family online. I will make sure to point out exactly which URL readers can go to find information and ensure that when I say "More information on the website" that there actually is actually more information on the website. Make a difference in the life of everyone that reads me. I want to be sure that everyone who reads me gets at least one insight or one piece of information that will change the way they think and lead them to change the way they behave. I am not sure how I will do this , but that's ok, even Unilever takes on challenges they don't know how they will deliver on. I just hope the effect is positive and not the other way. Wouldn't want anyone making a difference by committing suicide after reading all my 342 pages. This time, now that I am already in my 9th cycle, I am going to make sure that people start talking about the things that are printed on my beautiful pages.I will engage, encourage, enquire, en-everything. I will use social media (see next resolution). Most of all, I want the employees of the company that writes me to get talking. In order to do this, I will make a big effort to show up on their computer screens, in newsletters, training programs, round table discussions and on plasmas and notice boards. After all that, if there isn't even a teeny buzz in the organization, I will have to conclude that 2012 will be retirement year (for the VP of Sustainability). Get my own Twitter account. How many CSR Reports tweet, hmmmm ? I am gonna be the FIRST! Perhaps if I tweet my own stuff, I might be able to get someone to take notice of me. My first tweet will be: " I am a CSR Report, This is my first tweet." Hah! Can't wait. Betcha wanna follow me already. Avoid trash cans, shredders and recycling bins. Well, I know that recycling is all the rage at the moment, but frankly, I am not much good to anyone when I am recycled. I want to be prominently displayed wherever my writers' stakeholders are, and I bet you they are not in the trash can or in the recycling bin. And as for shredders, well that just sounds painful. Even us CSR Reports have rights. Refuse to be printed out too many times. Everyone makes a big thing about not printing out CSR reports, but I know that we are a vital part of our corporation's communications portfolio and we just need to be in hard copy some of the time. However, I will succumb to the flavor of the times and refuse to be printed out more times than is absolutely necessary. I have a deal with the toner. When I say stop, she says printer jam. Don't talk to annual reports. Look, until this integrated report thing kicks in, I don't want to have anything to do with annual reports. All you can find in them is money, profits, balance sheets, money, money, money.. as if that was the most important thing in the world. My audience is of a different quality. Don't let the hamster anywhere nearby. You all know what hamsters do to printed matter. They tear it up into little strips. Unless the hamster can unequivocably prove that it is interested in sustainability, I will activate my hamster-avoidance strategy which I plan to develop early in 2011. Don't allow them to wrap me up in fifteen layers of paper just to send me overseas. Many of my CSR Report friends have sent me postcards from exotic destinations overseas, like Manchester, having been bulk-mailed to a host of stakeholders around the world. Many of them told me that they were totally hot and bothered on the journey, having been wrapped up in several layers of paper, cardboard, bubble-wrap, shrink-nylon and I am not sure what else. We are a hardy breed, us CSR Reports. We can travel light. If any one wants to wrap me up well, I will resist to the death. RIP. All this talk about getting married to annual reports (you know, the integrated reporting thing) is not for me. Not in 2011 anyway. Until someone can come up with a good marriage contract so that my delicate CSR personality won't be totally obliterated by the dominant "A" type financial report, I am going to stay happily single. There are many people who tell me I serve no useful purpose .This year, I will fight back. I will tell everyone that I serve a critical purpose in the sustainability program of any business. Punch me below the belt and I will take my belt off and wrap it around your neck. HaHa. This has to be the year. For the past eight years, I have been overweight bordering on obese at a full 200 or more pages. This year, I will join the Weightwatchers CSR Report program, and get down to no more than 80 pages. No more Chunky Monkey for me. Well, until 2012, that is. This week I published a review of the McBride plc Sustainability Report 2009-2010 in CorporateRegister.com. McBride is an interesting company, kind of a behind the scenes player, manufacturing private label produces for retail chains, enabling the retailers to compete witth the big-brand-names that are their own suppliers. An interesting dynamic of retailing which seems to be gaining ground in many parts of the world.
" McBride plc is one of the leading behind-the-scenes players on our supermarket shelves, though you may not know it. They are responsible for manufacturing many of the private label household and personal care products for large retail groceries, supplying, amongst others, all of the top-ten retailers in Western Europe. The business generates revenues of GBP 812 million and employs over 5,000 people at 11 sites in over 20 countries in Europe, Eastern Europe and the Far East. Not a small concern by any means, it is traded on FTSE and has been included in the FTSE4Good index from 2009. 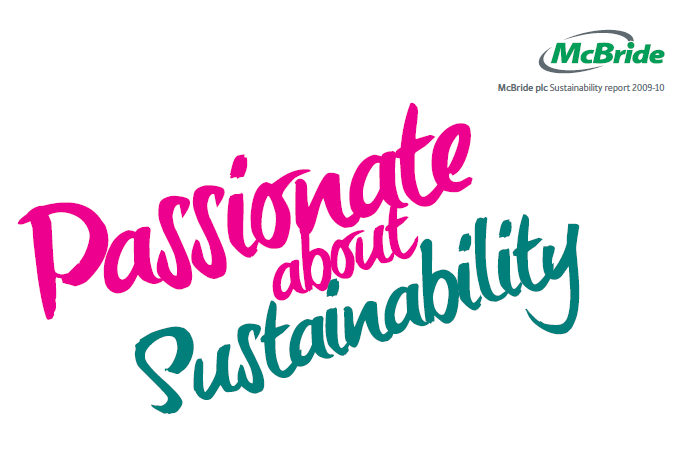 McBride is no stranger to sustainability, publishing their 7th report in 2010, entitled "Passionate about Sustainability". There is apparently no shortage of passion at McBride's – their Annual Report is entitled "Passionate about Private Label." This report packs a punch with a very nice design and clear presentation, especially relating to environmental targets. Overall though, it is rather basic in substance. Right on the very first page, McBride explains their "passion" saying, "We believe that Private Label has an important role to play in the economy". Private Label is indeed an interesting sector, though McBride provide little context about why this is so. Is this important role to do with the affordability of Home and Personal Care products to a wider range of consumers (as private label products are cheaper than branded products), thus enhancing access to hygiene, personal wellbeing and quality of life? Is it about McBride's ability to deliver formulations for a greener economy, supporting a more sustainable retail offering and changing consumer behaviour? Or is it about providing technologies to retailers that enable them to compete with the Unilevers, Procter and Gambles and other super-players of the home and personal care industry, and thereby changing the balance of power in the supply-demand game? In many ways, the Private Label industry is regarded as an invisible underdog, producing what they are asked to produce with little clout or influence. An example is given in a case study where, in response to heightened consumer concerns about the spread of viruses in the home, J Sainsbury asked McBride to produce an antibacterial cleaner which kills the H1N1 virus. McBride was able to do this on a very short lead-time, thereby gaining Sainsbury's recognition and enabling the retailer to offer consumers an innovative product on a fast timescale. However, lacking any sort of stakeholder engagement review or materiality prioritisation, this report doesn’t really answer fundamental sustainability questions or get to below-the-surface issues. The opening remarks of the Chief Executive Chris Bull confirm that "we remain aligned to the evolving need of our customers and our markets", but the report doesn’t elaborate on how these needs are ascertained or what they actually mean. On a positive note, however, McBride has been active in the development of the AISE (sustainable cleaning) charter, an industry association of private label manufacturers with a certification scheme, which is an important sector initiative. Let's hope that McBride passion for sustainability will translate over time into a broader view of their company's impacts, rather than a list of the things that they do. As it stands in this report, the focus seems to be on developing solutions that customers require, with focus a on greener products and improved eco-efficiency, staying close to sustainability aspects which immediately reduce costs (energy, packaging reduction etc) or are highly regulated (health and safety). The company is clearly getting to grips with the basics and this report demonstrates a positive direction but, as with my weekly household laundry, there is always so much more to do. " The McBride's sustainability website is a nice one, with flashing pics of employees saying how much they love to work at McBride. No matter how corny this seems, I think it's nice, and adds credibility to the corporate voice. Most people like to see their name in lights. This week saw the release of two multimedia digital online technicolour walking and talking sustainability communications - one is a CSR report and the other, a website which is the basis for reporting. These communications are clearly designed with the masses in mind. All those billions of people around the globe who have time to sit and watch scores of videos about company sustainability activities will be delighted at the flurry of box-office offerings now available on corporate sustainability websites. I will take a quick look at these two different online deliveries, and then share five recommendations for online reporters to mull over. "Burt's Bees open doors to greater sustainability with a multimedia social and environmental report" is the title of the press release on CSWwire.com announcing the arrival of the Burt's Bees movie. You can access the report here. Burt's Bees aspire to becoming "the greenest personal care company on earth". That's a big ambition, as is, indeed, their new sustainability report. The multimedia production is split into 10 chapters (welcome, this report, governance, culture, products, sourcing, packaging, community, environment, buzz) with around 75 minutes of video footage, supplemented by some data charts (make sure you enable pop-ups!). The videos are professionally produced and very slick, showing many of Burt's Bees real people who talk openly about how they do their jobs, what's important to them and the company, society and the environment. Most vids last between 6 and 14 minutes each. The two video clips I watched in full were Chapter 1 - the CEO's introduction - and Chapter 2 - with the delightful Yola Carlough, Burt's Bees Director of Sustainability who describes in 6 minutes what the company has tried to do with this multimedia report. Yola is worth watching for any number of minutes! However, I didn't manage to watch all the videos in full, though I scanned most of them briefly. The storytelling approach to this report describes the Burt's Bees processes and impacts, as far as I could tell, and it does give the impression that this company takes sustainability culture seriously. As far as embedding culture is concerned, Burt's Bees seems to have got it right. I assume this report was designed for consumers, the employees themselves (what a wonderful way to celebrate so many employees - turning them into movie stars - something to show their kids and friends and families - and potential Hollywood agents) and perhaps also for the army of Clorox people who own Burt's Bees and who themselves are advancing their own sustainability culture. Something I would add to this report is a document download with a list of the key impacts and performance data. A bird's eye view,or should I say a bee's eye view, of this report would make it more accessible to those who don't have 75 minutes to watch movies (or prefer to spend movie time with Angelina Jolie or George Clooney). Key content transcripts of the videos would be helpful. The other thing I would add to this report is interactivity. There is no room for comment or insight. Instead, Burt's Bees direct us to their Facebook page where they maintain they are "encouraging dialogue with readers". However, a brief look at the Burt's Bees facebook page shows only announcements of product promotions and consumer comments which appear to go unanswered. I didn't notice a "dialogue" about sustainability. It's a nice production, which may well appeal to a broader audience than the standard style of report we have come to know and love hate tolerate expect. 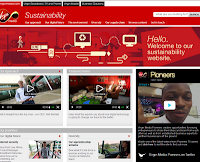 The other digital extravaganza announced this week on Report Alert was Virgin Media Inc's new sustainability website with the line "announcing a new approach to sustainability reporting" , the "new" being "exclusively digital." You can view this website here. This is not really a report, but the preparation for a report. Virgin Media promises to be updating sustainability data regularly on this website. As it stands, whilst this is a good piece of sustainability communications, little current data is presented beyond a download of carbon emissions. The first video clip - "Getting it straight from the top man - CEO Niel Berkett " is a 2 minute intro and holds a suprising fun twist which gets you smiling as you start out exploring the report. Well worth taking a look. In fact, all the vids have a touch of humour which makes you want to watch the rest of them. The website has five sections: our approach, our digital future, the environment, diversity, the supply chain. It includes a "Browse content" tab which lists download documents (policies and video files). I downloaded the carbon data file, for example, and immediately noticed a hike in the Virgin Media's carbon footprint between 2007 and 2009. There is no explanation in the narrative for this growing carbon footprint. The narrative references only the good things that Virgin Media are doing to reduce energy use. Virgin Media's CEO says that "he believes this is the future of sustainability reporting", referring to harnessing the power of digital media. Virgin's website/report site contains about 5 vids which are quite short and easy to digest. A nice feature is that they show Virgin people, which makes for a more authentic experience. However, the sustainability website is low on data so far. I looked at the section called Diversity. This is a general statement about Virgin Media's approach and an interview with the Chief People Officer , but there is no disclosure about how many employees are in the business, or any evidence that diversity is taking root, aside from a few mentions. Unless Virgin Media are going to beef this site up a whole lot with material and relevant performance data, then it will remain a sustainability website and definitely not anything that resembles reporting. Virgin Media tries to generate some action from readers with a "What do you think?" textbox on each page. I sent in one comment and a query - not sure where they went - hope they didn't end up in one of Virgin's fun-style recycling bins. It was only later that I noticed on the "Contact Us" page that they require contact details in order to reply to feedback. Oops. The feedback box doesn't ask for contact details. You just assume they will know. 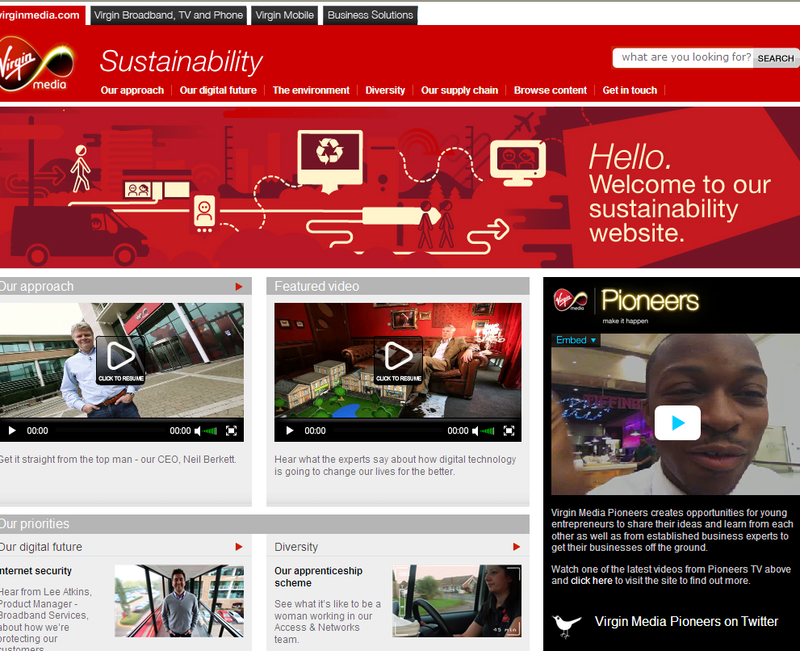 The Virgin Media website shows awareness and progress in sustainability activities. A clear set of targets was presented in 2010, which this website/report should follow through on in due course. The digital presentation is a good approach, but clearly needs to be filled out with relevant sustainability reporting disclosures. Two very different sustainability communication digital offerings from two very different companies. There is no doubt that writing reports first and foremost for online presentation requires a different approach to the written report, which can, once written, be presented online in different formats. Well done to Burt's Bees and Virgin Media for entering this relatively new and challenging territory, which I hope will serve as part of a learning process for them and others regarding the most effective communications and reporting formats for these companies and their stakeholders. Include a downloadable executive summary rather than just a series of videos or online pages. Some degree of choice for the reader between a written document and online content would increase appeal and useability of the information. Make individual videos short - 3 minutes is about my limit. Include the data in the body of the reporting narrative - not as an unrelated isolated download - and explain inconsistencies. Leverage the digital platform more effectively to generate feedback and create conversations. Ensure the enormous creativity and inspiration (not to mention adrenalin) required to produce fabulous digital design and videos and online content does not overshadow the fact that a report should also contain material disclosures and performance data. I couldn't let today end without a BIG congratulations to Danisco for winning the award for best report of a company listed on NASDAQ OMX Copenhagen A/S (C20). Read the full news item here. Having worked with Danisco on this report, I know how personally committed the team are both to sustainability and to transparent and comprehensive reporting. This award is a tribute to a company who is getting it right. See my post about the Danisco report from June of this year. PLEASE go to CRRA 11 and place your votes. Danisco for first place in the three categories above. 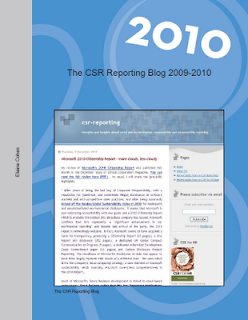 Complete with spelling mistakes, it also contains all the photos and visuals, all the CSR reporting blog posts and comments since the start of the blog which was in late 2008. It's not indexed but it does have hyperlinks to all the 232 posts from the first until this one on 9th December 2010, and it's a searchable PDF so if you want to find out how many times I talked about H&M (39), or Starbucks ( 45) or Vodafone (62) or even how many times I mentioned Chunky Monkey (wait for it ... 117! ), then you can do that with a quick click. The book is dedicated to "Everyone who ever wrote a CSR report and everyone who ever read one. Most of all, it's for everyone who ever provided feedback". Happy holidays everybody, and thanks to all for reading the CSR reporting blog! My review of Microsoft's 2010 Citizenship Report was published this month in the December issue of Ethical Corporation Magazine. You can read the full review here (PDF) . As usual, I will share the (pre-edit) highlights.
" After years of being the bad boy of Corporate Responsibility, with a reputation for (unethical, and sometimes illegal) dominance of software markets and anti-competitive sales practices, and after being summarily kicked off the Nasdaq Global Sustainability Index in 2009 for inadequate and unsubstantiated environmental disclosures, it seems that Microsoft is now embracing accountability with new gusto and a 2010 Citizenship Report which is probably the boldest this ubiquitous company has issued. Microsoft confirms that this represents a "significant enhancement in our nonfinancial reporting" and despite late arrival at the party, the 2010 report is refreshingly welcome. In fact, Microsoft seems to have acquired a taste for transparency, producing a Citizenship Report (65 pages), a One Report GRI disclosure (352 pages), a dedicated UN Global Compact Communication on Progress (9 pages), a dedicated Millennium Development Goals Commitment paper (16 pages) and Carbon Disclosure Project Reporting. The cloudiness of Microsoft's disclosures to date now appear to have been largely replaced with clouds of a different kind - the ones which drive the Company's cloud computing strategy, a core element of Microsoft sustainability, which ironically, Microsoft covers less comprehensively in the 2010 Report . Much of Microsoft's future business development is linked to cloud-based technologies. Steve Ballmer writes that this has "important implications for Microsoft's citizenship work", enabling access and rapid scaling up of technologies whilst opening up risks for privacy, safety and internet security. Environmentally, growth of cloud computing puts pressure on data centres and their energy consumption levels. Apparently, cloud computing will see the creation of 100,000 new companies and 1 million jobs in coming years, a development any software company cannot fail to ignore. Microsoft has been promoting the cloud as serious element in the company's support programmes for non-profits but admits to "hardly scratching the surface of what this could mean." By and large, not only greater transparency but improved structure and clarity characterize Microsoft reporting this time around. Whilst leaving us in no doubt about the scale of the Microsoft impact on the world economy and technology advancement (record $62Bn revenue in FY2010 and 89,000 employees in 100 countries leveraging the global Microsoft reseller/partnership network which itself employs 14.9 million people, representing 42% of the global IT workforce and generating over $500Bn revenue), the tone of this report is modest, factual and to the point. " Microsoft's report website is a pleasure to navigate and contains much more than the PDF summary. One smart feature is Microsoft's Local Impact Map which takes you on a world tour of Microsoft's presence in countries and cities, offering both statistics about the local economy and digital development as well as the specific interventions and impacts of Microsoft at a very detailed level. It's wonderfully interactive and a pleasure to play with, whether or not you are interested in Microsoft and their activities. Some of the stories are quite entertaining. Take this one about Microsoft's Unlimited Potential community technology skills programme in Sri Lanka: " When the local farmers from Embilipitiya showed up at Bimal Prasad's office, the eggplant samples they were carrying were not pretty. Covered in pockmarks left by an unknown pest, the vegetables were ruined and the farmet were desperate." What possible relevance could this have to Microsoft's business? Read the rest of the story to get to the happy ending and learn about an aspect of Microsoft's business which most would not be aware of. Whilst there are some areas which I suggested that could be tightened up in this years' Microsoft report, this is a major leap forward in professional and transparent reporting and is well worth looking at and learning from. This is a second in a series of posts on the CRRA 11 Reporting Awards, one of my favourite events of the year. The first was to comment on the awards announcement and urge all of you to VOTE! Voting is open until January 28th 2011. This post will focus on my favourite category: first time reporters. A global outsourcing services provider, employing 38,000 people, Aegis strives for Happy Customers, Happy Employees, Happy Shareholders and a Happy World! Guess it's ok for their suppliers to be down in the dumps. Haha. They also have a policy of sharing Happy Experiences! This report follows a GRI structure and appears to have a monopoly on bullet points. Almost every page contains bulleted lists, which makes for bulleted reading - like having hiccoughs. Happy Hiccoughs. It's a nice report, though, providing a good level of detail for a first effort. One thing, though, is that with this company targeting to contribute to everyone's happiness, I looked for they way they measure success. In an employee satisfaction survey, for instance, we can see that the Company does get good results such as a 95.75 score on "exciting growth opportunities" . But I was wondering if they asked empoyees the question: Are you happy at work? Doesn't seem like they did. Happiness is such a personal thing, I find a company whose mission is to make people happy a little surreal. Call me a party-pooper if you like. Alma Media is a Finnish media company, publishing 35 newspapers and providing a range of online services, turning over 300 million euros and employing 3,000 people. Not a small business by any means. I like the way this report addresses head on some core issues relating to media, journalism and sustainability. A key issue is the way local newspapers support a local sense of community. Very interesting reading. Another nice feature about this report is their consultation with stakeholders and the presentation of results. Not GRI, 28 pages, environment report only. Alaska Air Group is the holding company for Alaska Air and Horizon Air, the ninth largest carrier in the USA, employing 13,000 people and a net income of $121 million. They call themselves "fuel efficiency trailblazers" and do demonstrate good carbon emission reductions during this reporting period. In fact, though this environment report covers a range of topics relating to airline environmental impacts, the only data provided relates to fuel efficiency and emissions, with no data on any other parameters - water consumption, quantities of waste, recycling etc. Whilst this is a nice basic first effort from Alaska Air, as an Environmental Report it only goes so far, and as a Sustainability Report it doesn't make the grade. This one doesn't get my vote, I'm afraid. ArcelorMittal India (AMIL) is a subsidiary of ArcelorMittal, the global steel maker. This report is full of big photos and small print. It is mostly photography and graphic design work and light on content. It does provide some nice local flavor, making it an interesting report, but not a serious contender for winning an award, in my view. This is declared to be an "addendum" to ArcelorMittal's global report and as such it has a very local USA focus, and nicely covers performance highlights of this division of the global company. It packs a lot into 7 pages, but falls way short of a full sustainability report, and seems to me to be not quite beefy enough to compete in this category. Having said that, the initiative to publish a local report is laudable and I wish many more subsitiaries of global businesses would take this approach. Biogen is engaged in developing innovative therapies to meet unmet medical needs, employing 4,700 people. This report shows that you can cover quite a lot in 14 pages in a clever way, projecting a nice all-round CSR approach. This report was reviewed by Michelle Bernhart - you can read the full review here. This is a paragraph from Michelle's review: "The report is somewhat light on specifics. Some topics are covered with nicely written words but little substance. And, with two of the company’s founders having won the Nobel Prize for breakthroughs in biology, one might expect a more empirical approach, but the report is short on data. Environmental performance, for instance, is boiled down into just four metrics, although this does make for accessible presentation. It also appears the company has selected 2006 as its baseline year for performance data, which makes the limited data even more surprising. Apparently, Biogen Idec has been tracking these metrics for several years." GoLite is an outdoor apparel company, outsourcing all manufacturing, and also a Timberland brand licensee, adopting the Timberland Code of Conduct. "Transparency weighs nothing. Therefore I GoLite" is a nice introduction to this first report which doesn't go very lite at 157 pages, of which over 50 are appendices, of which 14 pages form a glossary dictionary of sustainability terms. This is one of those reports that rigidly follows the GRI indicator list, including the indicator number(s) with each subsection. It makes for a dry, disjointed report which doesn't allow the true nature of this company's unique sustainability story to shine through, which is a shame, because this company takes sustainability seriously. It is probably the most transparent of reports in this batch, going into great detail about almost everything. Slightly more focus on the trees and a little less on the wood would have been helpful. Assurance of this report was conducted by a Sustainability Committee of external experts who did not verify the data or content of the report, but commented on whether it is comprehensive. (Frankly, at 157 pages, it probably didn't need a committee to determine if they had left anything out) .On a positive note, I was surprised to read that this company employs only 25 people (I had to enlarge the PDF to make sure I had read that right!) . With such a small employee base, the production of such a detailed report is quite an achievement. A beautifully crafted first report, creatively and comprehensively presented, pleasing to the eye and following a nice TBL flow. It is structured around the GRI well enough for the familiar themes to be recognizable, but also follows a clear concept so as to be readable without the disjunctiveness (is that a word?) that rigid GRI adherence sometimes dictates. The report is entitled "We build tomorrow" and this theme is nicely woven throughout the texts. A performance dashboard at the beginning of the report and good reporting on stakeholder engagement and materiality make this report one of the best in the pack. The assurance statement is a little weak but this doesn't detract from the quality of the report. As an aside, when you look at the photo of the 17 smiling male directors of this company, it is easy to understand why there is no mention of diversity or disclosure on gender issues in this company. This is the company that owns Standard and Poor's, amongst other things, so it is fitting that a company who claims to help restore "transparency and trust" to financial markets should report transparently on its own business. This is quite a nice report, reasonably revealing for a first effort. It's straightforward, no pryrotechnics but modestly designed, if a little cramped, and it is a worthy entry in this category in my view. It glosses a little over materiality and stakeholder dialogue, but covers most other stuff at a mainly declarative level. I was pleased to note the company offers chair massages for employees. This report is entitled "We care" . Then I read that ONGCians work 24 X 7 throughout the year, and I wondered who cares about getting some sleep occasionally. The report is printed in a font which was designed not to be read, and the language is often amusingly stilted and contains spelling errors, but I battled on using speed-read and goggles. This is a report with a strong patriotic flavor, crediting its success to the vision of Pandit Jawaharlal Nehru, the first Prime Minister of India, who had faith in the potential of a domestic oil and gas industry. The report clearly shows a serious approach to sustainability, even if I had to skip a few pages where my goggles steamed up, and its materiality matrix, presented in the form of a Sustainability Risk Radar is quite a nice representation of what matters most in this company's sustainability efforts. Another nice feature of this report is the presentation of performance by the Company's Directors. This is a 240 people company generating over $118 million (AUD) through development of hydro and wind energy, with a net positive environmental impact. A nice first report, presenting CSR strategy well and including a number of focused case studies which give nice insights into the way this company is contributing to low-carbon energy production and serving communities. There is even a basic attempt to describe some indirect economic impacts of the company's activities - it falls way short of a quantified in-depth assessment of indirect impacts but it demonstrates a good conceptual approach to understanding and managing impacts beyond the limits of the company front door. Operating under a "non-profit umbrella", this organization provides housing in the UK - rented, sheltered, student and other forms of housing, employing 6,000 people. This is a wonderful first time report, written in a nice informal style and pleasingly designed. It has a people touch to it, with great coverage of the faces of the business and its stakeholders and relevant case studies. It's a little light on data, but a very good start into the world of reporting, with some nice insights about how reporting has helped this organisation advance its CSR objectives. SGS is an inspection, verification and certification company employing 59,000 people in 1,000 ofices around the world. The design of this report is rather disjointed and difficult to follow with awkward shapes and fonts and photography which doesn't relate to anything much. The report doesn't follow a storyline which brings out the unique contribution of this company to sustainability. It also contains an "Internal Assurance" statement, which is somewhat of an oxymoron. If it's internal, frankly, it can't be assurance. Actually I reviewed this report for CorporateRegister.com a while back - you can read my full review here. This is a little clip from that review: "This is a credible report, though light on data, responding only to a small number of GRI indicators. What is presented is clear and supported by relevant commentary. The report appears to be a solid reflection of where this company is on their sustainability journey, ie at the very early stages. However, they have woken up with a burst of energy and made a very good start." Virgin open up this document which is called a Corporate Responsibility and Sustainable Development Report with a comment that "it's not really a report but more of a think-piece or a discussion document." I am inclined to agree with them. It's masterfully oddbally creative in its design and is a real showpiece, much like the personality of its guiding light, the impressive Mr Branson. However, as a report to stakeholders, it doesn't really do the job. It's a collection of anecdotal and shiny stories about what Virgin has done well, but with no index and no reference to any external framework. It is hard to track where this company is in terms of sustainability. Each section is a separate topline summary of the different Virgin businesses, because, they say, "since Virgin companies span so many sectors, it wouldn't be relevant for us to outline just one set of targets". I don't buy that. And furthermore, I didn't see any set of targets. Just one target per individual business in the Virgin Group, as far as I can tell. However, this "report" is fun, it's peppered with interesting facts about the state of the environment and overall impacts of and on society, and interesting perspectives. It's a nice brochure to peruse, but not easy to navigate. A great document but not a winning report. I wish all first time reporters good luck in the CRRA 11 awards, and looking forward to them all becoming second time reporters.